Camille Utterback and Alan H. Davidson installing touch sensitive handrail for interactive light work. Over the past week, Camille Utterback has been installing her as-yet-untitled (suggestions?) interactive sculptural artwork for the lobby of the Showplace Theaters in The West End, St. Louis Park, MN. It’s all working! There are 6 tubes with LED lights hanging over the staircase in the lobby of the theater. 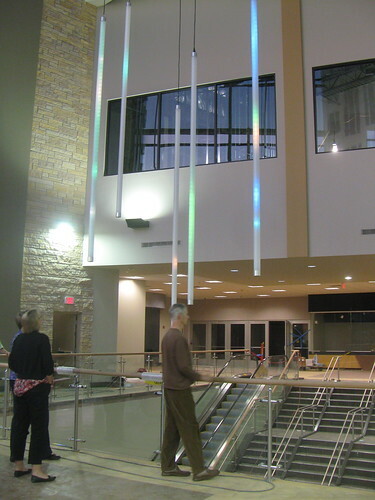 The LEDs react to people touching the handrails along the balcony. Each touch of a hand rail creates an upward “blip” in the corresponding LED light, which is the color of the rail at that moment. The length of the blip is determined by the duration of touching the rail. If all 6 rails are touched simultaneously, the lights rain down blips. Camille Utterback, untitled interactive sculpture, The West End. The balcony railing still needs to be stained, so the touch sensitive sections will not be permanently installed till next week, but it’s all working and ready of for the opening of The West End, which will begin in stages after September 15. See Alan H. Davidson’s excellent documentation on flickr and previous posts on Public Address.